This is the time for everyone to report in for their actions of the second week of the March-A-Long. As you may have noticed there was no podcast last Sunday, and I explained why in the previous post. I will be faithful in attempting to do a podcast tomorrow (Sunday) but may not also appear, some of the reason for that may also be evident in the previous post. For each week that you participate in the March A Long, I will put your name in a drawing to receive at least Leah Day’s beginning Free Motion Quilt book patterns called from Daisy to Paisley. This drawing will be done at the end of the month and may include more things, such as charm packs or other quilty items yet to be determined. I’m counting the first week from Sunday through Saturday. How was your second week? Here’s mine. Sunday I went through all the notes for the march a long (quilty related), and started attaching my fabrics to the back of the freezer paper for the freezer paper method of applique. Once I got into a groove this went quite well, but I did not spend only 15 minutes, more like an hour and a half doing this as it’s meditative & I was listening to the end of an audio book. I also cleaned up my desk enough to see the top (and hey its a week later, and what happened to it? ), but this lead to thinking about several long forgotten projects. Monday I continued pressing down applique until I was able to get most all of the fabrics done except for like 1 set. Tuesday, I had some extra time which I devoted into making caramel corn with peanuts (like cracker jacks) to take to the guild and to eat while quilting this week. Uh… I prepared some new paper piece patterns for a few new quilts, and during the quilt guild meeting I learned about quilts from the speaker, and did some hand sitching down on the trim on my periodic spiral quilt from a year ago. And took pictures of other people’s quilts, as per usual. Wednesday, I cut out the paper pieces for Hexadaisy pattern that I bought on Craftsy, started folding 1 section. I have enough pieces to make 2 quilts, one for guild auction, one for me. 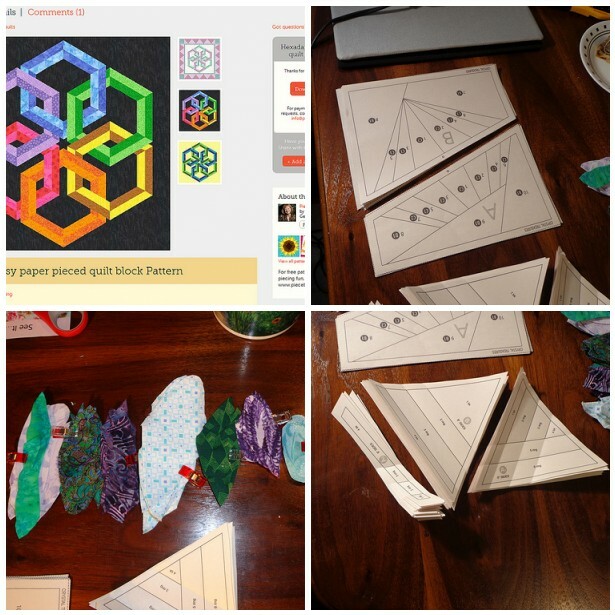 Friday, I cut out some paper piece patterns for a “new old” quilt called crystal treasures, a pattern I got from Quilts with Style magazine 3 years ago that I saw when cleaning up my room on Sunday. Saturday, well it’s still early yet, or it is. Work today kept me from posting this earlier. And tonight is another commitment, so we’ll see how I can get things done before it or not. Here are a few photos of this week’s progress and things I’ve been doing. Now here’s a chance to inLinkz for the second week of March. Sunday 10 Mar – Worked on the last part of a quilt top. Monday 11 Mar – Finished a quilt top! YEA!!! It’s a queen-sized quilt using the Generals’ Wives pattern. I LOVE it! Now to decide how to quilt it. Tuesday 12 Mar – Hand sewing on my Hawaiian Applique quilt. This will be a multi-year project. Working on block 2 of 13. Wednesday 13 Mar – More applique on lunch hour. Some organizing in my quilting space at home and some planning for a quilt top I am working on (blocks done, setting being designed now). Sat 16 Mar – Cut the muslin to back a piece in preparation for some embroidery on my Calendula quilt. Drew out the design for my 3rd Hawaiian Applique block, cut the design on freezer paper, transferred design to fabric. Ready to begin sewing. Proud of my work this week. I had a lot of non-fabric activities plus logged 39 run/walking miles and yet I didn’t let myself be robbed of my sewing time. It was a strange week. Sunday-Wednesday I did quilt 15-90 minutes per day. Mainly those days i pieced Easy St. and tied lap quilts for community service. I also received my vintage Singer 201-2 via ebay.Thursday and Friday my only quilting was looking through and weeding out quilt magazines. Today,I’ve watched The Quilt Show, and basted hexagons. 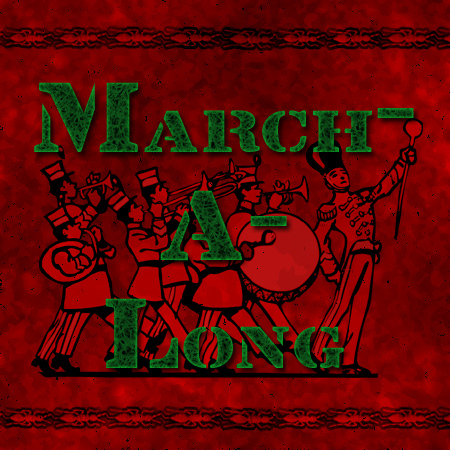 I linked up my March-A-Long post. I hope it linked properly. Thank you for the motivation. That Hexadaisy pattern is cool! You will have to tell us how easy/hard it is. Does it help with the tearing off to pre-fold the pattern? The prefolding helps me when it comes to putting the fabric together and sewing it down. This way I can see if the new piece is going to fit correctly when paper piecing. I don’t know if everyone does it, but it’s my method which helps me. Prefolding is better than “folding on the fly” due to fabric & paper and straight lines and such. AND I can do it while watching TV. I can’t see the links in the link up. Any ideas? I tried to make the post too quickly yesterday. I think the links are now restored. I will be starting my first paper pieced project in the next couple of days. I just added my update to the linky. Thanks for hosting March-A-Long, it is motivating. I keep thinking I will get my act together and do a blog post but I’ve been lucky I’ve been able to sew. at the beginning of the week sewing was relegated to blog reading and/ or podcasts and helping others with their sewing. I’ve had a productive sewing/ quilting weekend which has been wonderful. 3/12. 1.5 hours Does listening to quilty podcasts count? Here I am for the last report of the month. This has been a good quilting month for me, though this week is only 10 quilting hours long. It’s been interesting to see how long I do sew/quilt. I haven’t done anything new – just finishing up old projects.